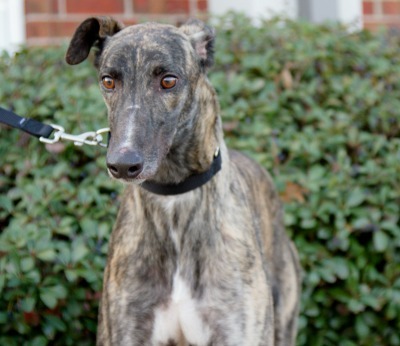 Boxster, aka JT's Man in Abox, is a 2 year old brindle male born May 16, 2015. His sire is KC and All and his dam is SE's Tali Aspen. Boxster had just three races at the end of 2016 at Valley Race Park in Texas before fracturing his hock on January 3rd. He is scheduled for surgery at the Dallas Veterinary Surgical Center with Dr. Radasch on January 12th. Dr. Radasch classified Boxster’s fracture as a grade 4 central tarsal bone injury. 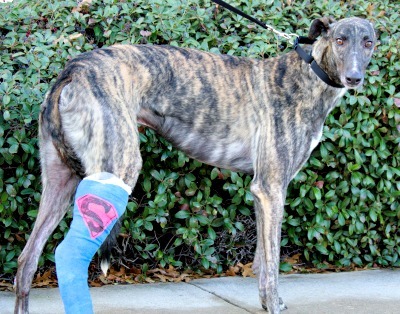 His surgery was completed today and Boxster will be in a cast for approximately 8 weeks with weekly bandage changes. Boxster will be kept very quiet in his foster home during this time. Boxster's x-rays reveal his fracture has healed, and he has completed his medical procedures. Boxster, Box-boy, Boxie, Box…..he responds to nothing but COOKIE! This big, super sweet, chill boy is all about the food. He is the first one in line to eat or get a treat and very polite when he takes a treat. Box crates like a champ, he even crates himself when we’re cooking dinner…..what a guy! He’s fed in the crate because he eats so fast and we don’t want him to hover over the other dogs while they’re eating. We let him out immediately after eating and he does his business – we just make sure he thoroughly waters the plants before he comes back in. When we say “outside” he knows what that means. Boxster is very calm on a walk and walks to walk, rarely does he pee or poop. It will be important for this boy to have a yard of his own. We do crate him when we leave the house and he gets the rest of his housemates to chime in rousing roo chorus. When we come home he’s calm as can be and isn’t hyped up to get out. He sleeps in the bedroom with us or on a dog bed in the living room or in his open crate. To date he has not even attempted to get on the furniture. Box is a happy boy, especially first thing in the morning and at meal time. He bounces and gets in a few nibbles of affection. Boxster was so good while he was healing from a broken leg, never once doing anything he wasn’t supposed to do. He gets into the car with ease and settles quickly; however, he isn’t too excited about getting out of the car because his trips have always been to the vet. Now that he’s available we’ll get him out for more pleasure trips to show him the destination can be fun. Box isn’t into doing zoomies, content more to wander around and enjoy the fresh air. He doesn’t have a strong play drive – he does like to shake stuffies and really likes to gnaw on soft toys. When other dogs get a little close to him while he’s resting he lets out low growl as a little warning, nothing more. He’s a bit protective of his space and thinks nothing about sitting with another dog on their bed. Box isn’t too interested in the other dogs and will likely do well as an only dog with people he can adore. He follows us around from room to room and is always close to one of us. His ideal home will have a yard, no cats or small dogs and people to love him for the wonderful boy he is. Boxster is a handsome brindle treasure.